In countries where collective bargaining is conducted mainly at the industry or regional level, there is often a type of workers representation at the company or establishment level other than a labor union. Where this double form of worker representation that is, labor unions and employee representatives exists, the relationship between the two can present a delicate problem in industrial relations. Decentralizing Industrial Relations is an in-depth country-by-country analysis, for nine major industrial nations, of three essential topics in this area: the relationship between labor unions and employee representatives, the shift in collective bargaining from industry or branch towards the company or establishment level, and the role of labor unions or employee representatives in the flexibilization of labor protective regulations. inclusion of disadvantageous working conditions in collective agreements or workplace agreements. In the aggregate, the study finds that, although employers are nowhere completely free to modify working conditions unilaterally, in all countries they can, abetted by the decline of labor unions and an emphasis on `flexibilization, make working conditions increasingly dependent on the individual employment contract. In this global context, the supremacy of labor unions is being questioned. This issue is undoubtedly one that deeply concerns all professionals interested in labor, employment, and industrial relations. This volume in Kluwers Bulletin of Comparative Labour Relations series reprints papers submitted to the 8th Comparative Labor Law Seminar (JILPT Tokyo Seminar) held on 21 February, 2006. Introduction; S. Ouchi, T. Araki. 1. Australia: Decentralisation and `Deregulation of Labour Relations through `Ultra-Regulation: Australias 2005 Labour Law Reforms; A. Forsyth. 2. France: Collective Relations in France: A Multi-layers System in Mutation; J. Mouret. 3. Germany: Decentralizing Industrial Relations and the Role of Labor Unions and Employee Representatives; B. Waas. 4. Italy: Decentralizing Industrial Relations and the Role of Labor Unions and Employee Representatives; M. Del Conte. 5. Japan: Decentralizing Decentralized Industrial Relations? 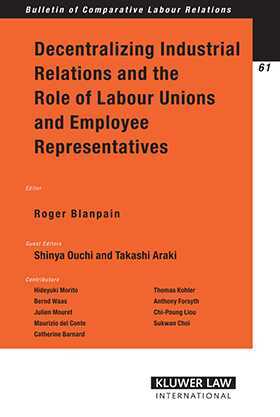 The Role of Labor Unions and Employee Representatives in Japan; H. Morito. 6. Korea: Employee Representation System in Korea; S. Choi. 7. Taiwan: The Roles of Labor Unions and Employee Representatives; Chi-Poung Liou. 8. United Kingdom: Worker Representation in the U.K.; C. Barnard. 9. United States: Decentralizing Industrial Relations: An Analysis of the American Situation; T. Kohler.